Simply put, EkoLakay is the social business model that SOIL is piloting to develop an ecologically and economically sustainable solution to the problem of sanitation access in Haiti. The brand name EkoLakay comes from a play on the Creole abbreviation of Ecological Sanitation (EkoSan) and the word for “home” (lakay). In Haiti (as in many developing countries), there are two kinds of traditional sanitation service providers: private companies and non-profits. Private companies empty septic tanks owned and used by wealthier ranks of society, but septic technology is water-intensive, often results in pathogenic and nutrient-intensive human waste flooding into poorer neighborhoods and vulnerable aquatic ecosystems, and is not a viable option financially for the majority of the population. Non-profit sanitation service providers, often as a component of international humanitarian projects, seek to provide viable options for the rest of the population, but these efforts often fail when donor interest inevitably wanes. The developing world is littered with well-intentioned projects that are abandoned without having created any kind of meaningful or lasting change. A social business model opens up a third way between unsustainable, foreign-funded humanitarian projects on the one hand, and expensive, exclusive, and environmentally-hazardous businesses on the other. Ok, so how does the EkoLakay business work? Customers rent an EcoSan toilet (built by local contractors using local materials) for about $5 USD per month; the fee also includes carbon cover material (used for flushing) and weekly waste collection. After collecting the full buckets, SOIL transports the waste to our compost sites, where, through a carefully monitored thermophilic composting process that exceeds the World Heath Organization’s standards for the treatment of human waste, it is transformed into nutrient-rich compost. SOIL then sells the compost for use in agriculture and reforestation projects, providing an environmentally-friendly alternative to chemical fertilizers while generating revenue to support the costs of waste treatment. Wait, hasn’t SOIL already being doing this for a while? We’re glad you’ve been paying attention! Yes! 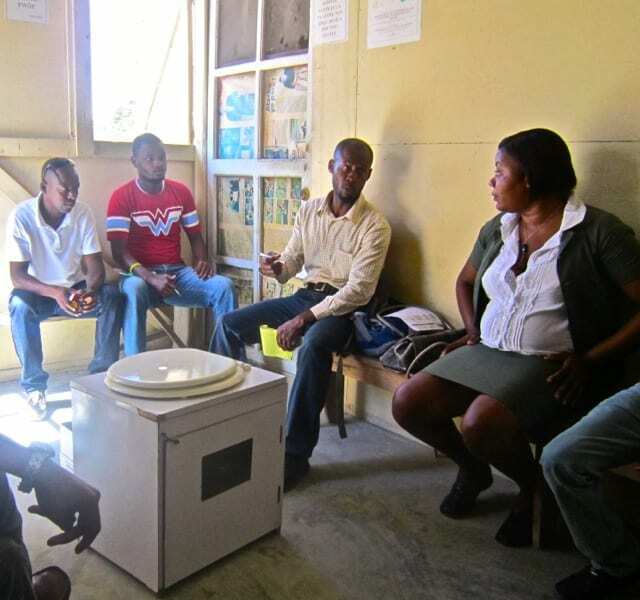 SOIL first began piloting a household toilet social business model in 2012 in the Shada II neighborhood of Cap-Haitien, and now serves about 300 families in the area. 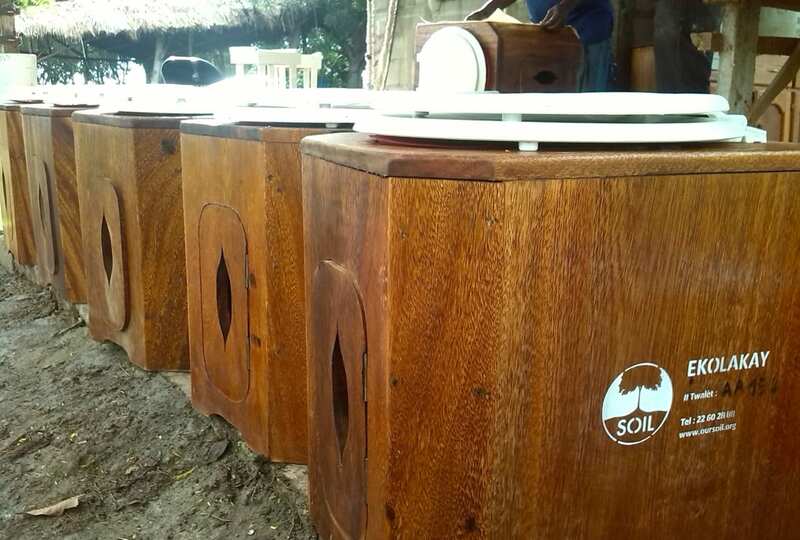 So what’s new about SOIL’s project in Port-au-Prince? We’ve learned many valuable (if hard!) lessons in our first two years of piloting this model, not the least of which is that it’s challenging to convince people with very limited means to start paying for a service when you’ve been providing them with other free services for quite a long time. Shada II is home to some of SOIL’s free public toilets, and access to safe sanitation is particularly limited there, so it was a natural place to start our pilot. But it was also difficult to help the community members understand that the free toilets that SOIL had been providing are not ultimately a long-term solution. EkoLakay Project Manager Claudel Mombeuil meets with representatives from a Ti Plas Kazo community group. We also learned that while we want to make our model workable in the most impoverished communities, starting there can give the false impression that this is a service only for the poor, even though EcoSan toilets are desirable even where other (i.e., conventional flush) toilets are an option! Building an initial base in middle-class neighborhoods will help SOIL establish EkoLakay as an aspirational service. The new pilot in Port-au-Prince will allow SOIL to implement these and many other lessons learned that are more easily accomplished with a fresh start, so we’re so excited to get the ball rolling in Ti Plas Kazo, a mixed-income neighborhood near the SOIL office, but one where our more traditional NGO services aren’t very well known. We also have a few employees who live in the neighborhood and are helping us build good connections there as we prepare to launch. With the support of the American Red Cross, SOIL will build an initial base of 50 customers in Ti Plas Kazo this year, which will allow us to continue to improve upon the Cap-Haitien model and experiment with how we can make the pilot even more cost-effective and efficient before scaling it up. A huge amount of gratitude goes out to Grand Challenges Canada for seeing the early potential of this model and supporting the scale-up in Cap-Haitian, to the American Red Cross for helping launch this new pilot, and the Swedish Postcode Lottery for supporting the continued expansion of this sanitation social business.. Also thank you to the Clinton Bush Haiti Fund, the 11th Hour Project, Konbit Sante, our research partners at Eawag and Re.Source Sanitation, and all our supporters who have helped us raise funding for building EkoLakay toilets. We couldn’t have done this without you! If you have more questions that you didn’t see in this post, leave us a comment below! And stay tuned for updates on Facebook, Twitter, and here on the SOIL blog for more news about the EkoLakay launch in Ti Plas Kazo! 4 Replies to "EkoLakay: Meeting Social Needs through Business"
I am an American traveling to communities in PAP, Haiti for the last 20 years. I am very interested in community sanitation and cottage gardening. Please give more information on how we can set up sanitary facilities in Cite Soleil, Terre Noire or Repatriote and beyond. We work stateside through Haiti Outreach Ministries (see website) and on the Haiti side through the Haitian-run organization, MICECC. A Haitian friend of ours just built a traditional latrine with his own money out in the poor, bare community of Lamarefrapaite. These earthquake transplants were taken there and have absolutely nothing. I look forward to hearing from you to see if there is a way we can work together. I am traveling to Haiti June, 2016. Thanks so much for getting in touch. I would suggest checking out our “Resources” page as a good starting point. You can also use the form on our Consultancies page to get in touch with Nick Preneta, SOIL’s Deputy Director, who may be able to answer a few questions for you and steer you in the right direction. Is SOIL limited at this time to only the pilot project in Ti Plas Kazo? We would like to explore the possibilities for a similar pilot project in Pister, an area in Limonade. What are the next steps? Thank you. Thanks for your comment, Judy! 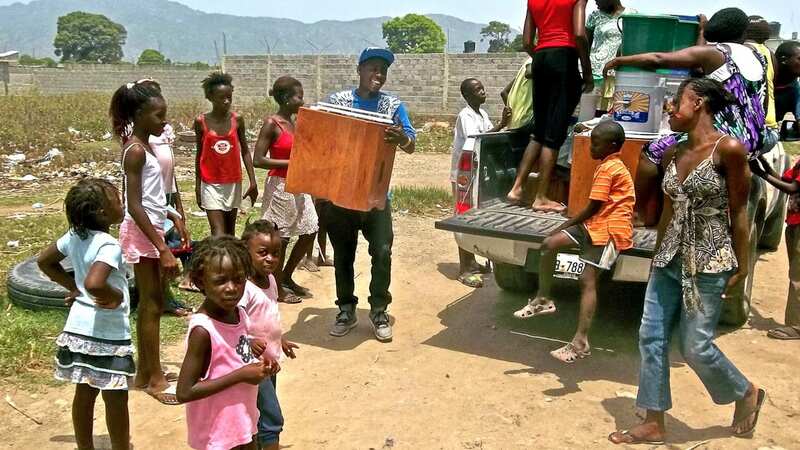 At this time we are working in 14 neighborhoods in Cap-Haitien and Port-au-Prince. We receive many requests to expand into new neighborhoods, and while we would love to expand quickly, we’re focused on honing our operating model within our current service areas right now. Feel free to reach out to us (info@oursoil.org) if you have any questions.